If you’re looking for a strong and versatile stainless steel eye-eye swivel fitting, you might want to consider something from our range here at Rope Services Direct. We also have swivel fittings with jaw-jaw ends and/or eye-jaw ends. 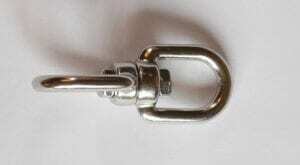 Part of our fantastic selection of wire rope fittings, the eye-eye swivels are ideal for use with our yacht rope to fix up damaged rigging or create a balustrade especially in the marine and leisure industries. Made of extra strong 316 marine grade steel, you don’t need to worry about them rusting or tarnishing even after a long time spent against the harsh elements and marine conditions. With sizes available to fit 5mm, 6mm, 8mm, 10mm, 13mm, 16mm & 19mm you’re sure to find the exact size you need. The only thing you really need to remember is to make doubly certain you’re purchasing the right width of fibre rope or wire rope to fit properly inside the eye. Rope Services Direct is pleased to supply eye / eye swivel attachments in a wide range of sizes from our substantial UK based warehouse. 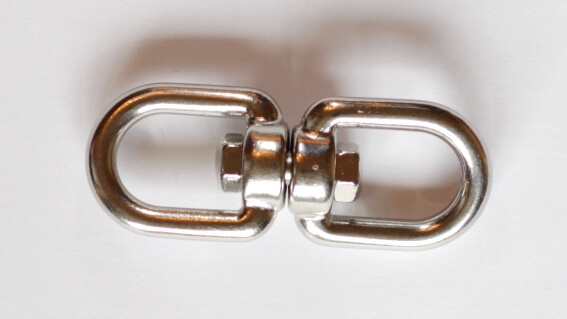 Whether you need the swivel for holding boat rigging or any other purpose or project, this type of swivel can fulfil all sorts of requirements. 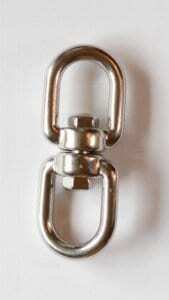 To order your eye / eye swivel(s), simply fill out a rapid enquiry form here. To ask a question or for further advice, please do give us a call on 01384 78004 so we can help. Eye-Eye Swivel Fitting Overall rating: 5 out of 5 based on 6 reviews.